Discover the magic of this ultra-soft luxury lounger designed to provide the ultimate in comfort and relaxation. 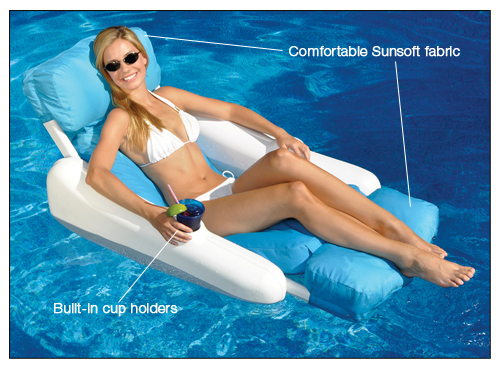 The super soft, yet durable, Sunsoft fabric combines with the adjustable inflatable cushion to provide you with head to toe support. No more sticking to a mat or getting sore from a support pole. 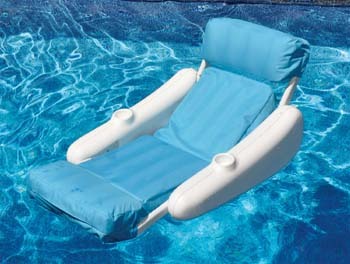 The molded pontoons provide great floatation and with 2 built-in cup holders, you may never want to leave your pool. Product dimensions: 66" x 23" x 3". 1 year warranty.